A promissory note release is a receipt that is given to a borrower after they have fulfilled the terms of the original note. This usually equates to the borrower paying back all that is owed to the lender, principal + interest. The release is signed by the lender and given to the borrower which should then be attached to the original note for their personal records. Once the release has been signed, the borrower shall be relinquished of all liabilities and/or obligations. The release is not required to have any witnesses at the time of lender’s signature unless otherwise required by the creditor. What is needed in a promissory note release? 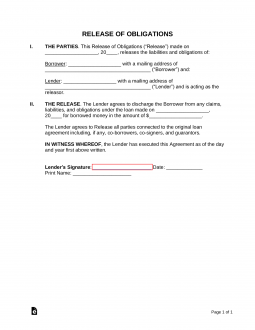 It is not necessary to sign the release note in the presence of a witness or notary. Like any legal document, signed copies should be distributed to both lender and borrower. What to do after signing a promissory note release? The promissory note and the promissory note release are bookends on a lending relationship – so the best practice is to file them away together. While it might be tempting to discard old documents, it is wise to save these records for a potential rainy day. An unexpected tax audit at some point in the future might mean that you will need the release note to verify dates and figures. Meanwhile, lenders sometimes ask prospective borrowers to prove that old debts have been settled. Finally, clerical errors sometimes occur at the credit bureaus; the easiest way to prove that you’re not delinquent in repayment is to document that a debt has been fully repaid.